Monday April 26th 1897 I cleaned the store room in the ice house in the forenoon and in the afternoon the summer kitchen. The boys were doing some things about the place they could not go in the field to work. Tuesday April 27th 1897 Will went up to the Hedges place for some things. I did the washing alone. The boys cut stalks in the forenoon and in the afternoon began plowing for corn. I was fixing some nests to set hens in the afternoon. 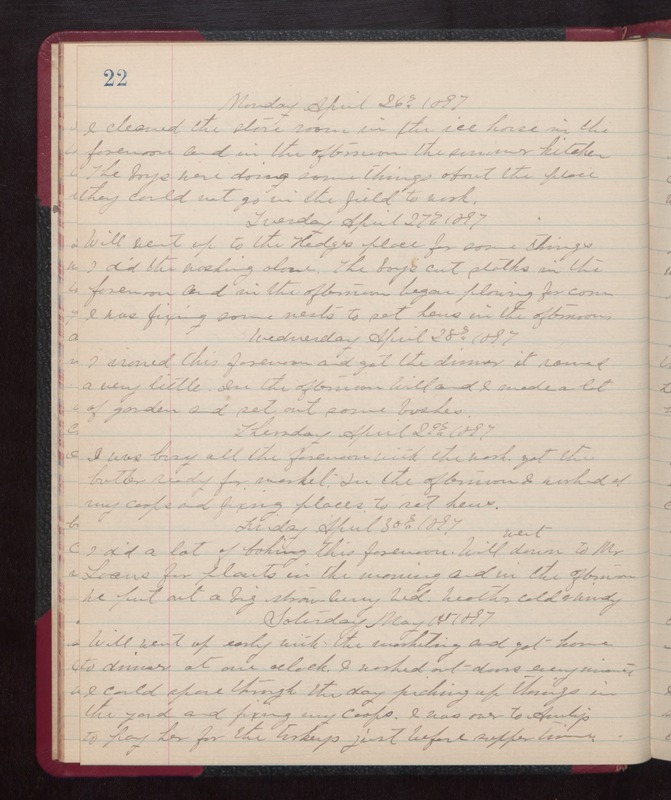 Wednesday April 28th 1897 I ironed this forenoon and got the dinner. It rained a very little. In the afternoon Will and I made a lot of garden and set out some bushes. Thursday April 29th 1897 I was busy all the forenoon with the work. Got the butter ready for market. In the afternoon I worked at my coops and fixing places to set hens. Friday April 30th 1897 I did a lot of baking this forenoon. Will went down to Mr Loans for plants in the morning and in the afternoon We put out a big strawberry bed. weather cold & windy. Saturday May 1st 1897 Will went up early with the marketing and got home to dinner at one oclock. I worked out of doors every minute I could spare through the day picking up things in the yard and fixing my coops. I was over to Auntys to pay her for the turkeys just before supper time.